G.SKILL launches the 5th Annual OC World Cup 2018 that will commence its Online Qualifier stage on the 13th of March 2018. For this year’s competition, the cash prize pool is higher compared to the previous OC World Cups with a massive total cash prize of $20,000 USD. The competition champion alone will be taking home half of it at $10,000 USD. The competition is open to all overclockers worldwide whether you’re a novice or a pro. The G.SKILL OC World Cup overclocking competition consists of three rounds: Online Qualifier, Live Qualifier, and Grand Finals. Once the Online Qualifier has concluded, the top 6 ranking participants will be invited to compete against each other in the Live Qualifier round, held live on stage at the G.SKILL booth during the first three days of COMPUTEX 2018, from June 5th to June 7th, 2018 in Taipei City, Taiwan. 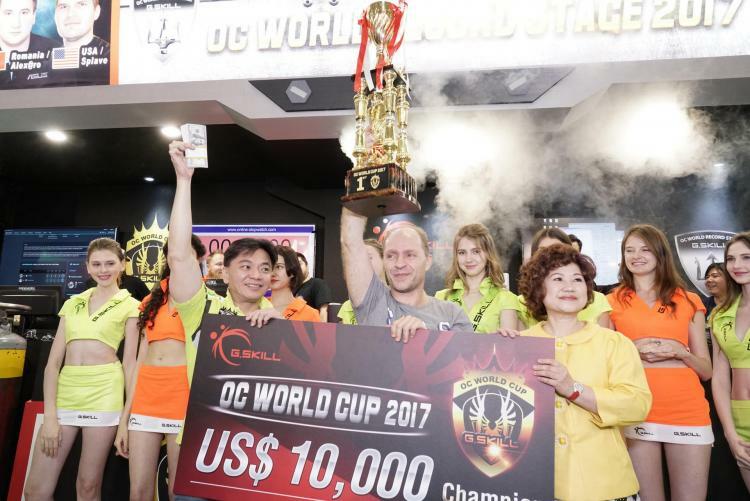 On the fourth day of COMPUTEX 2018, the top two contestants from the Live Qualifier will contend in a head-to-head deathmatch in the Grand Finals round for the Grand Prize of $10,000 USD and the title of “OC Champion of G.SKILL OC World Cup 2018”! The Online Qualifier round of the OC World Cup 2018 will be hosted on the HWBOT’s OC-Esports webpage from March 13th to April 16th, 2018. Participants will be ranked in the completion and scoring of 4 featured benchmarks: Highest DDR4 Frequency, SuperPi 32m, Geekbench 3 Multi-Core, and 3DMark11 on integrated graphics processor. Participants must use G.SKILL DDR4 memory, Intel Core i5-8600K processor, and Z370 chipset motherboards. Additionally, all participants of the Online Qualifier round will receive an entry to a lucky draw, where one lucky winner will receive a G.SKILL Trident Z RGB DDR4-3600MHz 16GB (2x8GB) high-performance memory kit!